Are you ready to truly live? To live life to the fullest like so many people claim to do? Then being a digital nomad is for you. The idea of living abroad might seem daunting at first, it was for me, but as the saying goes: ‘you can do anything you put your mind to.’ Living abroad is no different: the biggest thing is setting your mind on the goal of actually leaving. Where do you want to go? Tanzania in Africa where you can go on safaris, climb mountains, and layout on the beach all in one country? Maybe you want to experience city life in a different country: then Kuala Lumpur in Malaysia or a city in China might be for you. Maybe you want to learn a different language, or improve your spanish, for that, there are a myriad of countries in Central and South America to choose from. Once you make that first giant leap. That first step of faith that you can succeed in living abroad, everything will be much easier. Take it from me. I decided to leave the US just 3 months before transforming myself into an internet nomad and hopping on a flight to Bangkok. Sure I was scared, yes I was worried. Less than a month before my flight, I was still unsure how I would financially sustain my new lifestyle of living overseas. 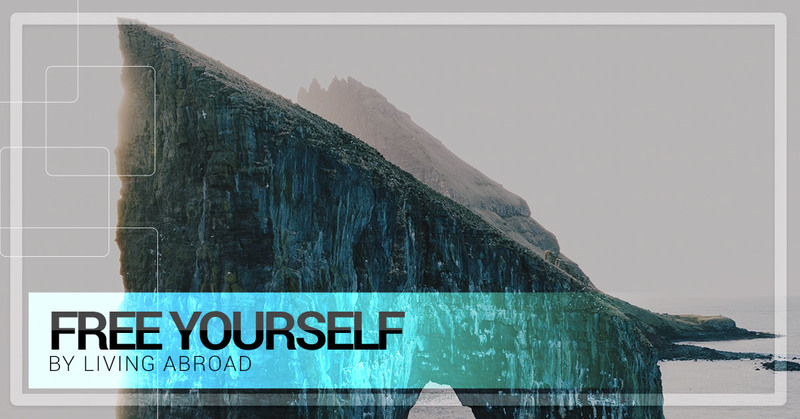 In this article we’ll explore some of the best places to truly free yourself from the chains of the norm and live overseas. The view from my apartment in Bangkok. comfort with western people and things. In Bangkok, the cost of living is cheap. Rent for my condo there that was 60 square meters (645 sq. ft. for us Americans), 2 bedrooms, and slightly off the western beaten path, was a measly $400 a month. Utilities, including decent wifi/ TV, electricity, and water costs just $120 USD a month and I shared those costs with a long time American friend. The condo came furnished as well. While I was there I could walk around my neighborhood for hours and see only a handful of westerners. If any at all. That part I loved. One caveat about Thailand is the somewhat unstable environment. And coups as recent as 2014 created quite an uproar. But neither of these affect expats a whole lot. If a more rural setting is your style you can also live in Chiang Mai in northern Thailand. It is even cheaper to live and allows easier access to surrounding countries and natural attractions like mountain hiking. China offers the same versatility, maybe even more so, than Thailand. Not only is the landscape more diverse, with mountains, deserts, forests, rural and foreign regions but the culture is diverse as well. China is thirsty for teachers. Armed with a just TEFL, Top Notch ESL can help you land a job anyone in China with a very competitive salary. Considering that many Chinese- even in the larger cities- live off of 3000 RMB (about $500 or £304 in August 2015 exchange rates) your salary of anywhere from 8000-15000 RMB starting pay is very large. With a bit of planning and not living lavishly you can certainly save quite a bit of money while working here. The amount of parks and general greenspace in Beijing was certainly surprising. Beijing is my current home base. It is considered by all to be the center of culture, economics, politics, and art in China. Like any large city there is no shortage of things to do- ever. And it is a big city. In 2013 its population was 21 million. That’s bigger than the six largest cities in the US (New York, L.A., Chicago, Houston, Philadelphia, and Phoenix). Or the eight largest cities in the UK (London, Manchester, Birmingham, Leeds, Glasgow, Liverpool, Southampton, Newcastle). Guangzhou is a hot tourist attraction because of its proximity to the ocean. Shandong province. Being more of a tourist oriented city than others its size, items that are necessities (groceries, utilities, etc) have a far greater disparity in price to luxury items (including beer, and western foods). Guangzhou is another economically important city in China. It is the largest seaport in the south with a population over 8 million. It was one of the first free trade zones that China began establishing in the late 70’s and 80’s and has developed quite well because of it. The biggest draw for expats living in Guangzhou is the food. It has the largest number of restaurants per capita in China and has shaped the way the Chinese view Cantonese cuisine. Shenzen Just across the bridge from Hong Kong, Shenzen is also a popular destination for expats. Not only is the hustle and bustle of the special administrative district of Hong Kong within easy access but there are beaches close by as well. However, besides amusement parks, shopping is probably the biggest attraction in here. One of my personal top choices to move to should I choose to explore Latin America. Chile boasts ancient sites such as the Atacama Giant and the ever famous, Easter Island. Furthermore, Chile’s primary language is Spanish, making it easily accessible to a large portion of Americans. Who doesn’t know at least a little Spanish? Donde esta el bano? The seaport and amazingly picturesque city of Valparaíso also sits just 70 miles (112 km) from the capital of Chile, Santiago. WiFi is easy to come by, albeit slow. The cost of living approaches that of American/ European prices with a draft beer costing around $2.25 USD and a small apartment costing roughly $600 USD. The expat community is plentiful here as well, with a multitude of ESL (English as Second Language)/ EFL (English as Foreign Language) teachers living here. If cheap living is what you’re looking for to begin your expat digital vagabond lifestyle then the Philippines are where you should head. Manila and Davao both have a cost of living moderately cheaper than that of Thailand while still having several amenities that westerners look for. Including plenty of English speaking nationals, and eco-adventures. Beaches, whitewater rafting, wakeboarding, camping, hiking, and horseback riding are all easily accessible. Davao, as well as the capital city of Manila, both have a vibrant nightlife. You can live like a king here on $1000-1200 USD. Once you make that first step and move to a foreign county you will feel empowered. You will soon realize, like I did, that the world is yours and nothing is truly off limits. Often times the limitations we live with are simply self-imposed. Breaking yourself from these nonsensical barriers and living life as an expat will open your eyes in more ways than one. While living abroad you will learn more than you thought possible and experience life through a whole new lens.